Can you name the ingredients in your shampoo? Can you name even 3? I can. Not only do I know exactly what is in this hair shampoo, I’m saving money and getting healthy, glamorous hair that turns heads. Seriously, and it is all thanks to homemade hair shampoo. 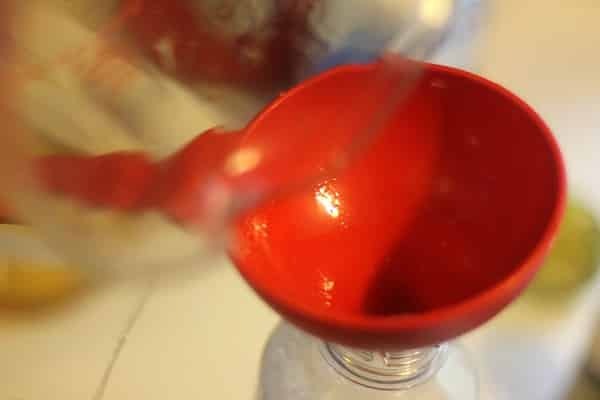 Homemade hair shampoo is just as hygienic as the stuff you’re shelling out big bucks for at the store. Plus, it is super easy to make… it’ll take you all of 10 minutes (tops!). Hmmm, I don’t think you have an excuse not to try homemade hair shampoo… like right now! 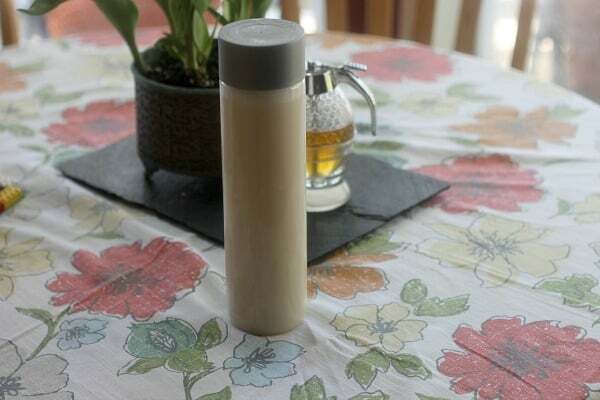 Want more tips and recipes like this homemade hair shampoo how-to? Then be sure to follow Freebie Finding Mom’s DIY Beauty Tips Pinterest board. 1. Heat water; you’ll want it very warm. 2. Dissolve honey in water. 3. Pour into chosen container. Note: I didn’t want to use glass in the shower so I upcycled a VOSS water bottle for my homemade hair shampoo; for more convenient dispensing you may wish to reuse a shampoo bottle. 4. 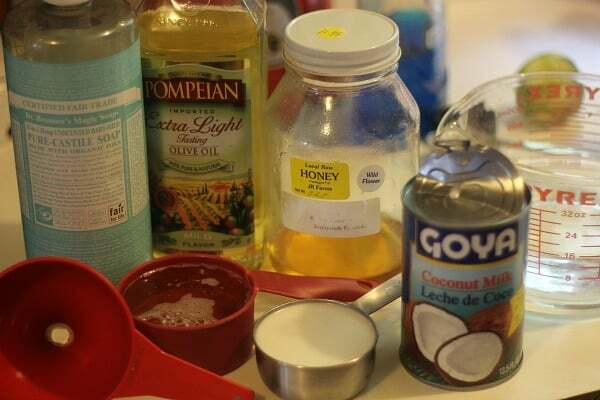 Add Castile, oil, coconut milk, and any oils to the bottle. 5. Swirl gently; shaking will cause it to foam up and spill over. Note: You’ll want to swirl gently before each use. If you feel you need a conditioner in addition to this homemade hair shampoo, pick up a bottle of apple cider vinegar from the store, pour some through your hair after shampooing, and rinse well with water. I would love to use this recipe to create my own shampoo, the problem is that I’m from Mexico and finding Castile soap is quite hard, is there anything else I can use to replace it? You can use goats milk soap or coconut oil soap in place of Castile soap. Thanks for this… Because of the coconut milk, how long will this last before going bad? I did a coconut milk body wash and after I think 2 weeks it was starting to turn. I have had mine for over a month and I have not noticed it turning. If you add some vitamin E oil it acts as a natural preservative and you should be able to get at least 6 weeks out of it. How much vitamin E oil should you add? I waswwondering if younneed to store this in the refrigerator. With the use of coconut milk does it need to be refrigerated? Would it be all right if I substitute coconut milk for coconut oil? I’m not sher where to find Castile soap and coconut milk, they should be at the regular Walmart/grocery stores right? Thanks!! You can find both Castile soap on Amazon and I can find coconut milk in my local grocery store. Not sure you can substituate coconut milk for coconut oil, never tried this. Target has Castile soap in two sizes. Can I substitute raw African Black Soap instead of Castile soap? Hi Amanda, I have never tried, so I can’t attest to the effectiveness of African Black Soap. Let me know how it works out. Most of natural store bought shampoos dry my hair out really badly. Please let me know how you like it. Thanks. Can I use grapeseed in place of the almond oil? I have never tried, so I am sorry I can not attest to the effectiveness of grapeseed oil. Let me know how it turns out. Can I use coconut oil instead of olive or avocado oil? Yes, coconut oil should work fine. I tried out this shampoo recipe for the first time today and it made my hair really greasy! Is there something I can modify to help? I made it with the exact proportions you have in the recipe. Should I be using only a little? Or could I add more castile? Maybe cut most or all of the oil or my hair just needs to adjust? Please help! I really want to make this work. Coconut oil can be greasy, so you may need to wash your hair multiple times to get it all out. Hope that helps. First off, I love this recipe and I’m for the most part happy with my new attempt. I also have ran into the issue of my hair being greasy. ALSO, the shampoo doesn’t like my colored hair as it leaves it dry BUT it does like my natural hair that is growing out (it isn’t dry). I used the exact measurements that the recipe called for. I used Almond Oil and for my essential oils I used Lavender and Roman Chammomile ( 15 drops of each. 30 drops in all.) Do you have advice for making it less oily? I know this is a little late, but I’ve read where it takes 1-3 weeks for your hair to adjust to a natural shampoo rather than store bought shampoos. Hope this helps! Rachel, you’re probably using too much, try using small amounts and because it’s a natural shampoo it doesn’t foam like regular shampoos do. Hope this helps. 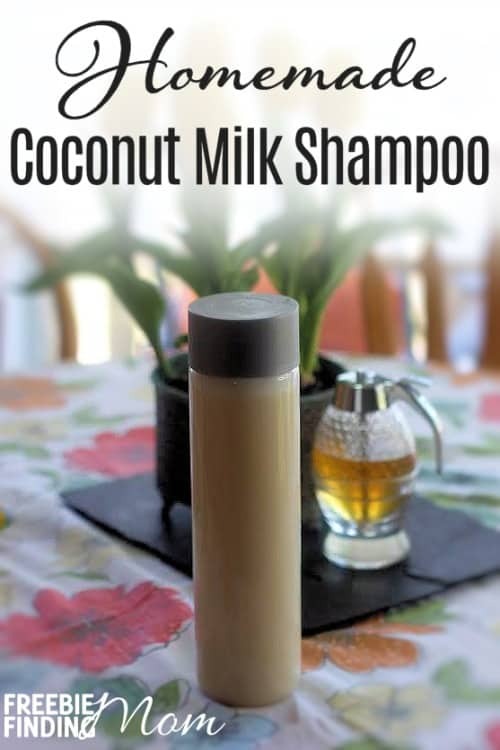 Coconut milk is supposed to be amazing for your hair so this is right up my alley! I love coconut oil, too, si I imagine this is similarly great. Thank you for sharing! I love coconut oil on my face and body instead of creams and lotions. The oil I buy is from the baking section in the grocery store (Walmart) in a square container. In cooler temperatures it is solid and becomes liquid when it is warm. I have been very pleased with the use on my skin. I tried it on my hair for about a month and quit because I was disappointed. It would probably be best to use the Apple Cider vinegar rinse after shampooing, I will give it a try. This looks like a great recipe. Is it safe for colored hair? This will not be safe for color treated hair or anyone’s hair unless the ph balance is around 5. You can do a litmus test to check. These are strips you get at the health food store and dip in it. Hi, where do you store your shampoo? In the fridge? Or just in the shower? Also, how often do you wash your hair? And how long did it take for your hair to adjust to homemade shampoo? Hi Korinne, You’ll definitely need to wash your hair thoroughly to get all the coconut oil out. Hi, i whippe up a batch of this shampoo but it left my hair very oily, is there anything I could add to help with this or maybe something i missed? I used teat tree oil in mine 🙂 thank you! I love the recipe you have shared this blog. This shampoo is awesome, Thanks for sharing these article. Hi! Made this. Love it. Excited because it is natural. But I am having the same problem with extra oiliness. You’ve said in response to multiple comments that it needs to be washed thoroughly to remove all the oil. Could you elaborate? Do you mean continue to rinse with water and scrub? Thanks! I am making for gifts, what size bottle would I need? Hello, I made this tonight but instead of the 1.5 cups I accidentally put in 2 cups. Will it still be okay to use? Not sure, Samantha. Did it work for you? Hi! I been trying to use this recipe but it feel too oily. What do you mean by washing very throughly to remove all the oil. With another shampoo bought from store or with water or what do you mean? Hi, I made this for my husband & his feedback is it too runny, it feels too oily in his hair, he would like more lather. Is there another product I can add to thicken it up & increase the “lather”. I also thought I would use less olive oil or another oil that leaves less oily feeling. Baking soda acts as a stripper and it adds lather, so you might try that. Thanks for the recipe! I’m a bit confused – your ingredients list coconut milk but some of the comments reference coconut oil. Which one should I use? You can rinse your hair using using fresh lime or lemon juice it will help to reduce the oiliness. Hi. Love the coconut milk and the way my hair felt after using this, however upon looking in the mirror I was unhappy with the results. After playing with a few recipes, I’ve increased the Castile to 2/3 cup and decreased the coconut milk to 4/3 cup. I also used a measuring spoon for the avocado oil instead of eyeballing it. Lastly, I made sure the ingredients were well mixed before I used them(oil floats). I, now, always do an ACV rinse in my hair, which helps with the oiliness. The next time I wash my hair (2-3 days), I use only mixture of baking soda (1/4 cup) and water (1 cup). Mix well, put on hair. Scrub like I would shampoo. Let it sit while I finish washing the rest of me. Add a bit more water and give an extra little scrub then rinse well. To be finish with an apple cider vinegar mixture (1:8ratio). My hair has never been better!! And I’ve used the expensive Wen shampoo for the past 19 months. I made this shampoo a few days ago and it smells great but its super runny, almost just water consistency. Is it supposed to be this liquidy? This is my first time making homemade shampoo so I’m not sure if its supposed to be this way. If so, any tips on how to wash with it? I had to tilt my head back and dump it on and it wasted a lot so any advice would be great! I’ve tried homemade castile shampoos. They worked when we were on a well but when we moved to city water the castile soap gave a horrible disgusting buildup. I had to go to a salon and have them strip my hair. I’ve heard that Apple Cider Vinegar rinse helps with this buildup from the castile soap but It didn’t work for me. As long as I can’t softened my water I can’t use this kind of soap. Just giving my experience so others can understand that it could also be the Castile soap that is causing problems. My recipe didn’t call for oil except a drop or so of Vitamin E oil so it was NOT the oil that caused my gross build up. Hi, thanks for the recipe but what are some of the additives in ghetto store bought coconut milk should we watch out for? What kind of coconut milk? Can, box, or fresh. This effects how much oil is in it. I’m just wondering if you checked the ingredients on your coconut milk? It’s not a pure product and made with coconut essence for flavor and some other nasty things to get the milky texture, at least that’s all I can find here. Coconut milk and cream make me queasy when I eat them in cooking. I’m not having a go at you but just wondering if you were aware of it or if there’s some better coconut milk out there I’m not finding?